On Tuesday, February 21, the Philadelphia Water Department joined a broad group of partners, including Fishtown residents, parents, teachers and students from the Adaire School community, City departments, the School District of Philadelphia, the William Penn Foundation and the nonprofit Trust for Public Land to break ground on Philadelphia's latest green schoolyard project. 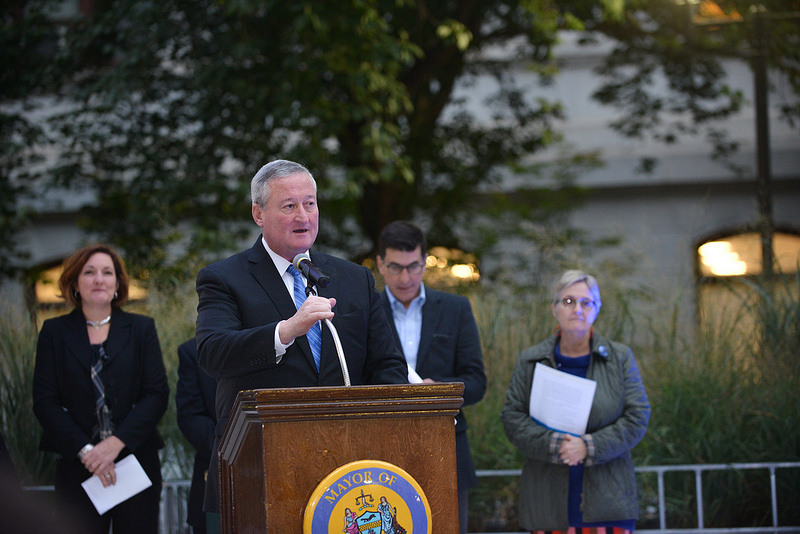 On hand were a number of public officials, including Mayor Jim Kenney, School District of Philadelphia Superintendent William R. Hite, Council President Darrell Clarke and Managing Director Michael DiBerardinis. If that list of names and organizations seems long, that's because it is: to make projects like this a success, it takes an entire community and support from both the City and nonprofit institutions. For PWD, this marks the seventh public school to use our Stormwater Management Incentives Program (SMIP) to help pay for schoolyard improvements that both add green landscaping and protect our rivers from stormwater runoff and sewer overflows. 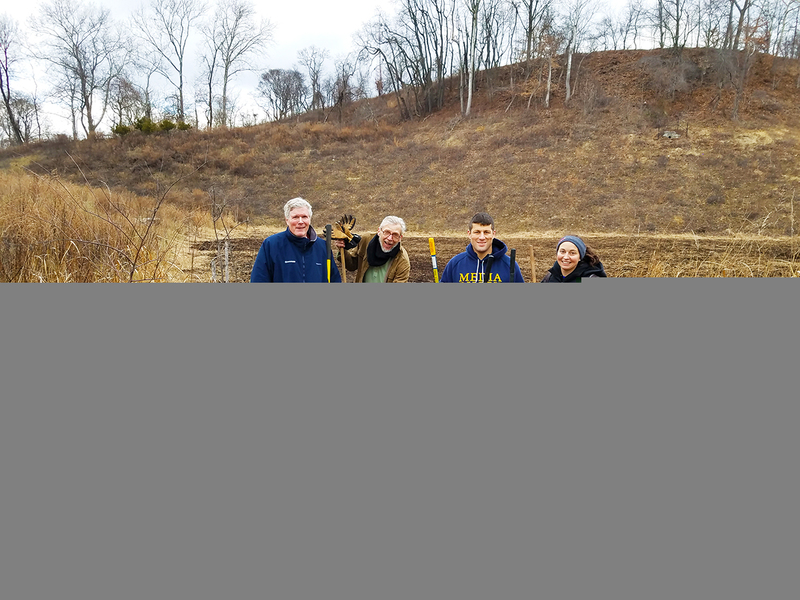 PWD is providing a $650,000 grant that will fund a beautiful rain garden will soak up rainwater during storms and work to protect the Delaware River every time it rains. Without the new green space, that portion of the Adaire schoolyard would just be another patch of neighborhood asphalt. 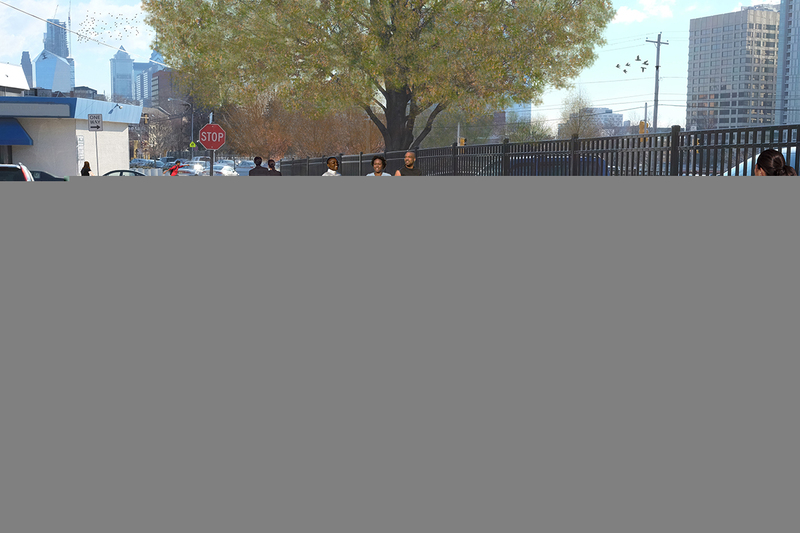 In addition, the Philadelphia School District and the Trust for Public Land are installing a colorful playground, new basketball courts, upgraded play equipment and shade trees. Getting to the start of construction required a tremendous amount of planning and input from the Fishtown community and the Friends of Adaire, a dedicated nonprofit group consisting of parents, educators, and community members. The result is a vibrant new community play space that lets kids connect to nature while helping the City meet the ambitious goals of the Green City Clean Waters stormwater management program and school district's Green Futures plan. Now in its fifth year, Green City Clean Waters consists of hundreds of green stormwater infrastructure sites around the city, including green spaces at schools like Adaire, all of them working to reduce annual sewer overflows by an estimated 1.5 billion gallons. The rain garden designed for Adaire alone will manage over 70,000 gallons of stormwater for every inch of rain that falls in Fishtown—if you put all that water into our blue 55-gallon Rain Check rain barrels and stacked one on top of the other, the pile would be more than seven times higher than Philadelphia City Hall! And, since we tend to get a lot of rain in Philadelphia, the contribution of projects like this can really add up. During a typical year of Philly weather, Adaire's green infrastructure will manage about 4.2 million gallons of stormwater runoff—making the Delaware River that much cleaner. Grants distributed through SMIP are a key part of Green City, Clean Waters growth. We use the program to help businesses, schools and other institutions build cost-effective green tools that improve communities and protect our waterways. In our current fiscal year, PWD has committed nearly $14 million in grants towards 31 projects that will bring green infrastructure improvements to places including the Eastern State Penitentiary, LaSalle University and Target. In the years ahead, we look forward to working with more Philadelphia schools to create green schoolyards that protect our waterways, provide new community spaces and offer hands-on environmental education for the next generation of Philadelphia citizens. Over the next five years, the City and School District partnership with The Trust for Public Land aims to complete 30 green schoolyards and recreation centers, and we're planning to make stormwater improvements a part of those projects whenever possible. The citywide partnership is funded by a combination of City, State, and School District sources, leveraged by private funding raised by The Trust for Public Land. Philanthropic support for the program began with a leadership grant from The William Penn Foundation and The Trust for Public Land continues to lead an ongoing fundraising campaign to support the development of new sites, including support for community participation in the design process and seed funding for stewardship and programming. Praising the Adaire rain garden, PWD Commissioner Debra McCarty noted that SMIP-funded projects at schools are an investment in some of our city's most invaluable resources. “Green schoolyard improvements like this protect our rivers from stormwater runoff and teach the next generation of Philadelphia citizens about the importance of improving water quality, making this a win for Fishtown, the environment and all of Philadelphia,” said McCarty. Learn more about Green City, Clean Waters and the Stormwater Management Incentives Program. Those interested in learning more about the next phase of improvements planned for Adaire can also visit the Friends of Adaire page.